There is so much information available today on the Web regarding Google Local Business Listings, how to claim them and how to climb in their ranks. There are research sites and white papers, but none that actually help you step-by-step (online) through the process of claiming and building a solid Google Local Listing, until NOW! We have been publishing online interactive training guides for years, and have recently added 2 new classes. These online tools were tested live at the New England Trade Show and Conference with raving reviews and we are now announcing it to the general public. 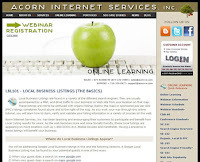 These new classes may be accessed online at the Acorn Internet Services, Inc. Web Site LBL-101 and LBL-102. LBL-101 is the basics for Google Local Listings, and LBL-102 is the more advanced how-to’s for Google Local Listing placement. You don’t need to waste your time re-typing links and scouring information from a white paper, or digging through all the research sites to make sure you don’t forget an important step. We’ve done it all for you and have it located in an easy to use online format. Take a moment to share your success by clicking the Comments link below!